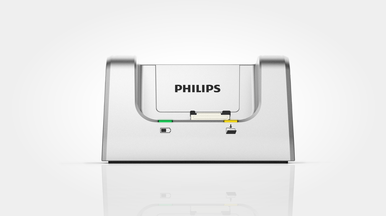 Introducing the new Philips DPM8100. This machine is available in a number of versions. This Model DPM8100 has a slide switch operation of Record, Stop, Play & Fast Rewind. 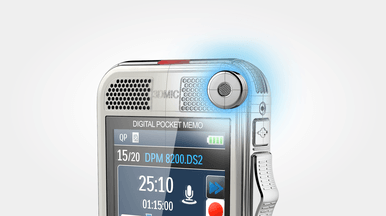 The Pocket Memo DPM8100 dictation recorder takes dictation to a new level. Breakthrough 3D Mic technology delivers best audio quality in any recording situation. NOTE: Hardware recorder only. 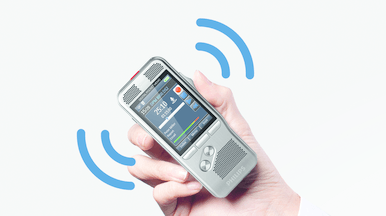 Device does not come with a license for the Phillips dictation/transcription software. This must be purchased separately if required. A recent video of the DPM-8100 in action with Dragon Medical Practice Edition. A better quality video can be accessed by viewing the video on YouTube directly and selecting the 1080p quality option. 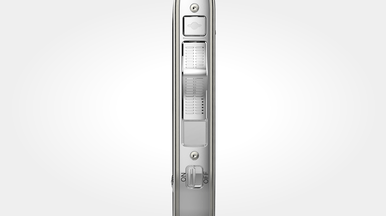 The Philips DPM8100 is the latest and greatest digital voice recorder from Philips. 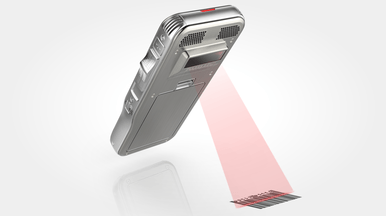 This unit replaces the LFH9600 which was the previous top-of-the-line professional voice recorder from Philips in Germany. What’s amazing about this recorder is focused around the build quality, digital audio performance and user functionality. You really do need to hold this device in your hand to appreciate the fully stainless steel construction that extrudes quality and engineering expertise. I use one of these devices personally in the voice recognition office and it always impresses people when they see it in action. It’s very robust and expertly crafted. It feels like it would last for years and years. The superb digital audio performance comes from its new 3-D Mic technology system. Essentially, there are two omnidirectional 360° stereo microphones which can pick up multiple speakers in a meeting but are also highly optimised for dictation and speech recognition use. This makes this recorder a great transition recorder from people coming from analogue tape as it simulates the same type of system as tape ‑ but brings all the advantages of the digital audio technology. A large high-resolution colour display makes it really easy to identify the state of the recorder and it’s easy and intuitive to operate the menu system. 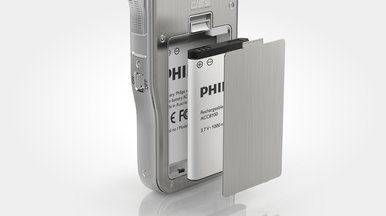 The new Philips DPM8100 also has a high capacity lithium ion battery pack that can be charged with a standard micro USB connector. The runtime is outstanding. The DPM8100 also comes with a high quality docking station which allows you to quickly charge and automatically transfer your digital voice recordings to your computer (or your support staff). 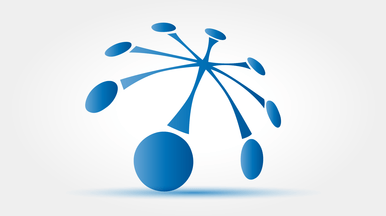 This integrates seamlessly with the Philips speech dictation (SpeechExec) software that is supplied with the voice recorder. 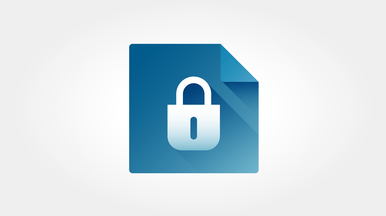 Recordings can also be encrypted in real-time using 256 bit encryption protocols, so your data is secure. 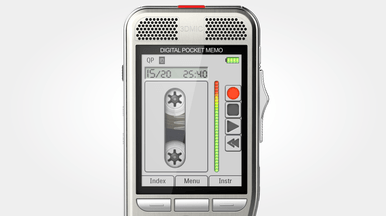 You can also pin code your voice recorder to protect against unauthorised file playback. The bottom line is that this is one of the best (probably the best) digital voice recorders on the market. It has an extremely high build quality, very high quality audio and functions that advanced users need ‑ without an overly complex interface. 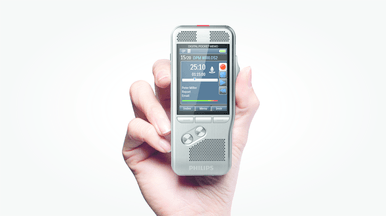 These solid features make the Philips DMP 8100 ideal for use with optional Dragon Naturally Speaking or Dragon Medical Practice Edition 2 speech recognition software packages. If you have any questions, please call us on 1300 255 900 and we can answer your questions about the Philips DPM8000/DPM8100. We do use them in our office and have a high degree of expertise in Philips digital voice recorders and transcription equipment.